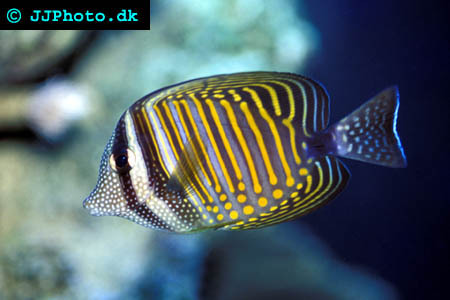 Company: Zebrasoma desjardinii (Desjardin's sailfin tang) should be kept with small fishes. Aquarium Setup: Give your Zebrasoma desjardinii (Desjardin's sailfin tang) quite a lot of space and strong water movement. Live rock with algae growth is a big plus, for food as well as for hiding and sleeping. pH should be between 8.0 and 8.4. Temperatures in the mid-seventies to low eighties F. are ideal. High oxygen levels are necessary. Food: Zebrasoma desjardinii (Desjardin's sailfin tang) feed mainly on algae such as Valonia and Bryopsis, but they also like macrophytes like Caulerpa spp. Give your Desjardin's sailfin tang vegetables every day. Breeding: There have been attempts at spawning and rearing various Acanthurid members in captivity, but the knowledge available is still close to zero.